A dog friendly cafe is moving into the Ost Cafe's old spot. EAST VILLAGE — You've heard of cat cafes — now get ready for New York City's first dog cafe. A father-daughter duo this winter will open a "dog-friendly" cafe and lounge at the corner of East 12th Street and Avenue A where patrons can hang out with their beloved pets, enjoy a cup of coffee or glass of wine, and shop for dog merchandise all under one roof. 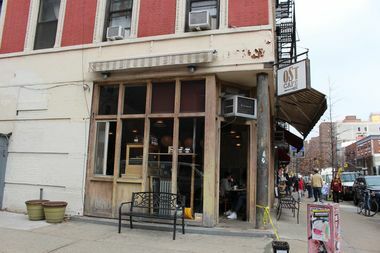 Two storefronts are being combined to form the two-fold space — the cafe side will occupy the space recently vacated by beloved Ost Cafe, while the dog-friendly side will take over the former Raclette cheese shop, which moved to a larger space in September of last year, according to EV Grieve. "What we found is, a lot of people like dogs and because of their circumstances can't have one — so this is a dog-friendly place," said Coppy Holzman. The spot will also cater to those in the market for a furry friend — dog adoption events in partnership with Badass Brooklyn Animal Rescue, where Logan Holzman has volunteered, will take over the dog-friendly space on weekends, said the duo. The father and daughter were inspired to create a place where they could bring their pets — Coppy Holzman has a pit-bull mix named Boris and Logan has a terrier mix named Horton — after taking note of the city's cat cafes, where visitors can come to play with kittens. They soon found a few spots allowed dogs, but not in a way that complied with the city's health code. "A lot of people were doing it under the radar and getting fined by the Health Department, but we were like, let's find out a way we can do it where that's our core business and we do it the right way," said Logan Holzman. Community Board 3's State Liquor Authority Subcommittee on Monday unanimously voted to recommend the SLA give the spot a license to serve wine and beer as long as the operators adhered to certain stipulations, including installing soundproofing and monitoring noise from canine visitors. Dale Goodson of the North Avenue A Neighborhood Association said locals had expressed some trepidation about the spot bringing rancorous barking and unwanted dog waste to the block, but the operators guaranteed the board and neighbors they would ensure their patrons were quiet and their sidewalks were clean. "It's a coffee shop, dogs are allowed — we're not boarding dogs, we're not having large packs of dogs," said Coppy at the meeting. "We're going to have very polite rules of etiquette. ... We want a relaxed environment, so dogs acting inappropriately we won't allow there." If all goes according to plan, the cafe should be up and running by December, said the Holzmans. Park Slope bar The Gate was once known for being dog-friendly, but the city's Health Department cracked down on the pub and banned pooches in 2014. However, there are a handful of watering holes left where canines are welcome, according to a recent NBC New York report.